A recent study from Tulane University made headlines last month when it suggested that relative sea level rise – rising seas combined with the sinking or disappearance of land within a specific region – may be underestimated in river deltas across the world. The study specifically looked at measurements of relative sea level rise from tide gauges, instruments typically anchored deep in the ground that record changes in water surface elevation. 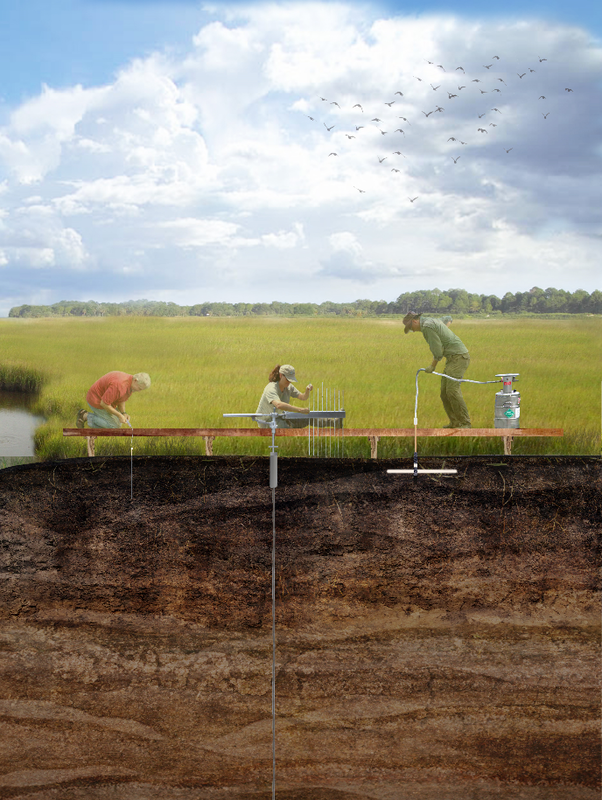 Researchers concluded that tide gauges alone couldn’t accurately measure the compaction and sinking of river sediments occurring close to the surface, which is where most subsidence in Louisiana’s occurs. Why does sea level rise monitoring matter? Accurate relative sea level rise estimates are critical to inform how low-lying coastal communities worldwide plan to meet the challenges of rising seas. In Louisiana, this information is needed to develop and implement the Coastal Master Plan and for the safety of our coastal communities. This Tulane study made waves when it was published, but Louisiana is already solving the problem. As the researchers point out, tide gauges are not the only method of measuring elevation change and relative sea level rise – and Louisiana already has more effective tools in place as part of one of the largest coastal monitoring programs in the world. The Coastal Wetlands Planning, Protection and Restoration Act (CWPPRA) was authorized by Congress in 1990 to identify, fund and build coastal wetland restoration projects. Under that mission, the CWPPRA Task Force established Louisiana’s Coastwide Reference Monitoring System (CRMS) in 2003 as a collaborative mechanism to provide detailed monitoring of the health of Louisiana’s coastal landscapes. CRMS is the largest coastal monitoring program with publicly available data in the world. The program brings together multiple federal and state agencies to collaborate on coastal monitoring efforts – making monitoring more cost and time-efficient for agencies, in turn providing more easily accessible data for coastal researchers and residents. Nearly 400 active CRMS sites across coastal Louisiana continually monitor soils, hydrology, land change and vegetation. Stations located in each basin and marsh type collect data which can be openly accessed online, downloaded and manipulated as needed for free. CRMS monitoring sites along the Louisiana coast. Credit: CRMS. Illustration of land data collection at a CRMS station. Credit: LSU Coastal Sustainability Studio. Soils are monitored for their characteristics using cores taken at each CRMS site. Since it takes time for soils to accumulate, samples measuring soil organic matter, moisture and salinity are taken only every 6 to 10 years. However, the amount of sediment that accumulates over time (called vertical accretion) is measured twice a year using sediment cores. Marsh elevation change is also measured twice a year using Rod Surface Elevation Tables. Unlike tidal gauges, which are typically anchored deeper in the earth, elevation tables have more shallow foundations, capturing shallow subsidence and yielding more accurate estimates of local relative sea level rise. Illustration of water data collection at a CRMS station. Credit: LSU Coastal Sustainability Studio. Hydrology is also measured at CRMS stations using a variety of floating data loggers, called sondes, which collect hourly data on surface water salinity, temperature and elevation. Permanently installed samplers annually assess salinity levels at the vegetation root zone, providing early warning signals for potential vegetation loss and subsequent erosion. Satellite and GPS imagery is another method of obtaining data on sea level rise along the coast. Land change monitoring depicts land-to-water ratios from satellite and digital aerial imagery of the coast, measured at least every 3 years. Land change in Barataria Bay from 1932 to 2016. Credit: CRMS. Vegetation monitoring involves measuring various kinds of plant species at marsh and swamp sites. Aerial sampling completed each year records vegetation cover and species diversity. Field visits every 3 years catalog the size and species of trees, shrubs and other plants found in forested areas and use that information to classify wetlands (e.g. marsh or swamp, fresh or saline). Louisiana also has extensive LIDAR, or Light Detection and Ranging, datasets that provide high-resolution data on elevation levels across the state. LIDAR is a low-cost, highly accurate system of airborne instruments that utilize GPS and laser sensors to derive elevation data. 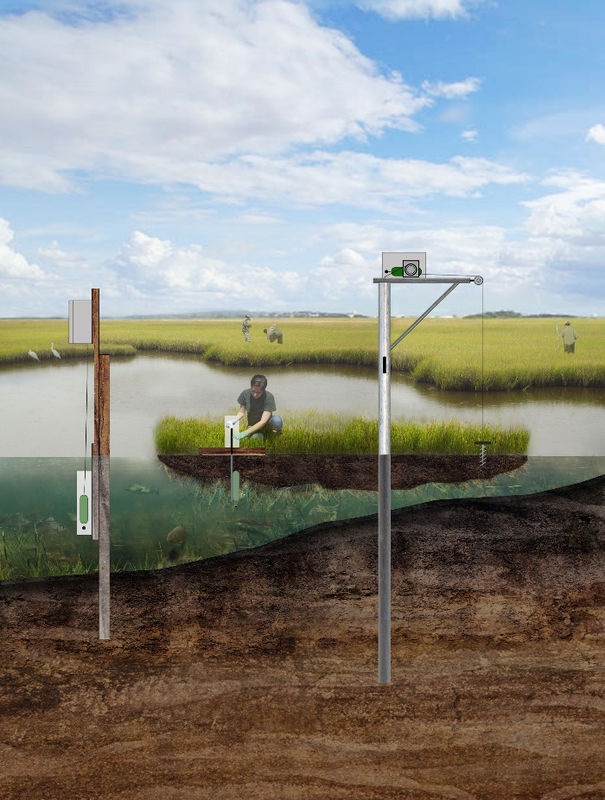 This method is particularly well-suited to coastal Louisiana due to the difficulty of on-the-ground measurements in remote coastal marshes and wetlands. From 2000 to 2009, the Federal Emergency Management Agency (FEMA) and the State of Louisiana partnered to fund the Louisiana Statewide LIDAR Project, which provides high-resolution elevation data for the entire state. More recent LIDAR data from USGS is available on NOAA’s Digital Coast website. Analyzing the relationships between all of these data helps scientists understand how different types of coastal environments are changing over time and how that affects everything from coastal communities to habitat for wildlife and fisheries. Louisiana is leading the way in state-of-the-art monitoring with one of the largest coastal monitoring programs in the world. As our coastline continues to change, these programs are a key resource to help accurately predict relative sea level rise and plan for the future of our coast.